Pickled radish has long been a staple side dish in Korean cuisine. It's sweet, sour, and crunchy, and is almost always a component of traditional sushi rolls (kim bap). It's also often served as a side dish to starch-heavy dishes like jja jjang myun, a mouthwatering dish of al dente noodles smothered in a sweet black bean sauce with sautéed chopped onions, carrots, sweet potatoes, and some type of ground meat. 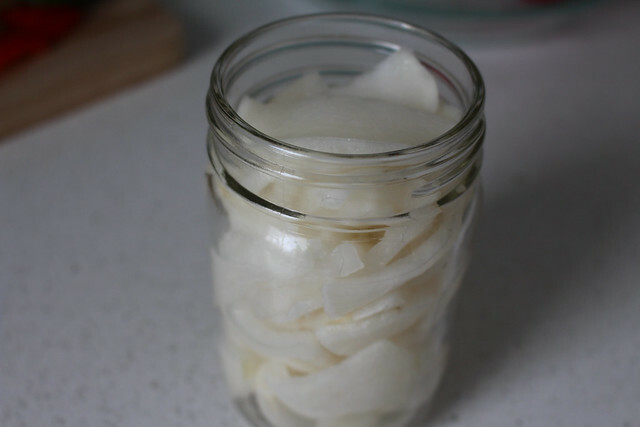 Pickled radish is typically made with white radish, called moo in Korean; it's sometimes called daikon or Chinese white radish, and in Indian cuisine, it's called mooli. If you can't find white radish at your regular grocery store, try visiting a local Asian food market - most carry multiple varieties. 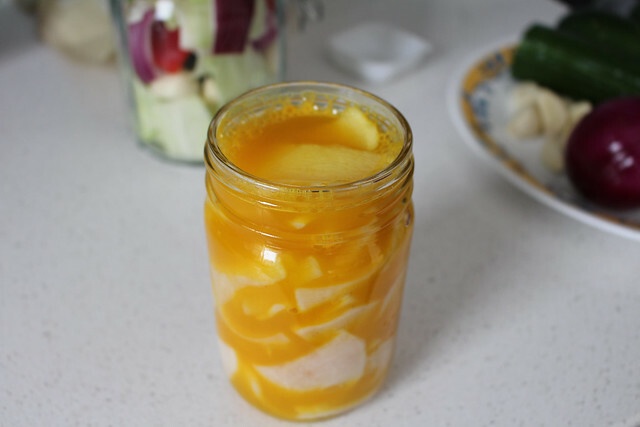 Pickled radish is ridiculously inexpensive to make, and provides a plethora of micronutrients, the most prominent of which are vitamin C, folate, potassium, and copper. It also supplies good amounts of calcium, iron, magnesium, phosphorus, and vitamin B-6. And of course, all types of radish are famously abundant in fiber. 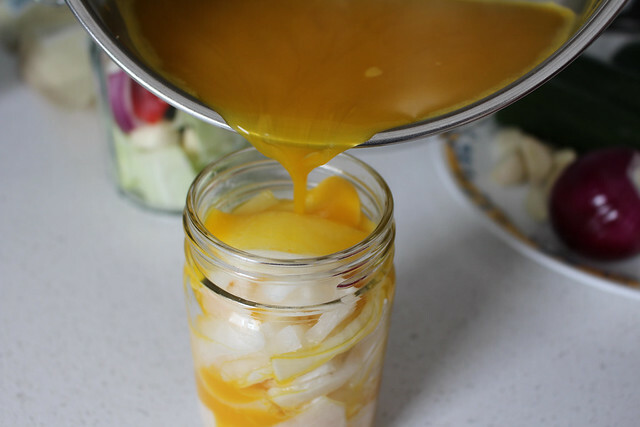 Commercially prepared Korean pickled radish is often dyed yellow. 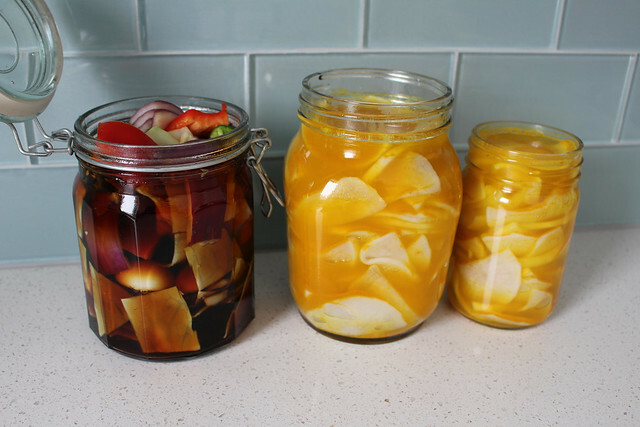 To create this same vibrant appearance and add significant nutrient value sans artificial dye, my mom came up with the idea of using turmeric to create her own yellow pickled radish. 1. 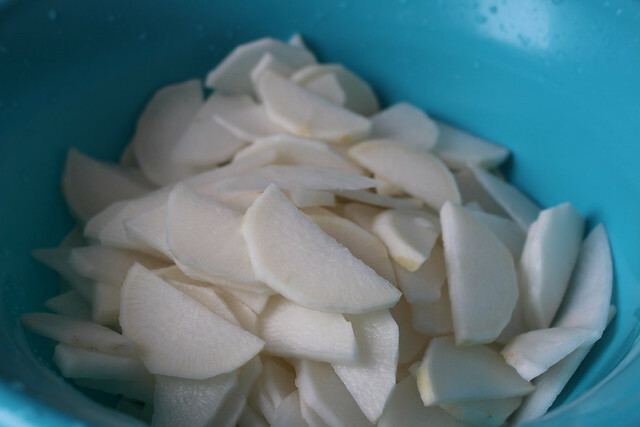 Start by peeling your radish, cutting in half lengthwise, then chopping into 1/2 cm half-moon slices. Put radish slices into a large bowl, sprinkle one flat tablespoon of sea salt over the radish slices, give them a gentle toss to distribute the salt, and let sit for about 20 minutes or until the radish slices soften to a point where you are able to gently fold a slice without breaking it. Here's a look at a peeled and an unpeeled radish. We didn't have our best peeler available on this particular day, so we had a bit of a hack job on our hands. 2. Once your radish slices are bendable, don't be shy in using your hands to squeeze off the liquid that has come out of the radish and transferring your slices to a glass bottle - this is the bottle that you'll be allowing your radish to ferment in for a couple of days before eating, so be sure that it's clean and that you have a lid for it. 3. 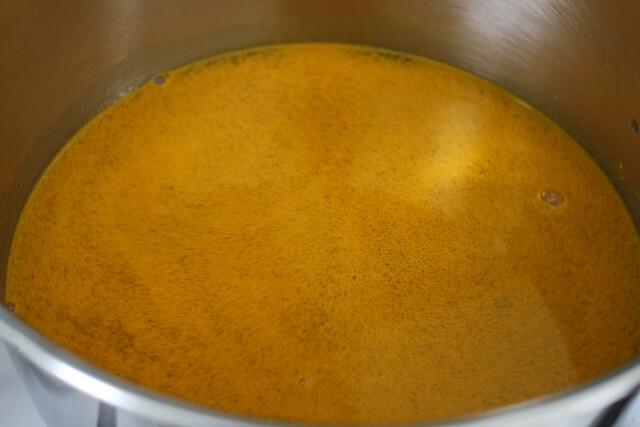 To make your turmeric brine, bring one cup of water to a boil, then add your vinegar, turmeric, and one flat teaspoon of sea salt. Reduce heat and stir gently for a minute to evenly distribute everything. 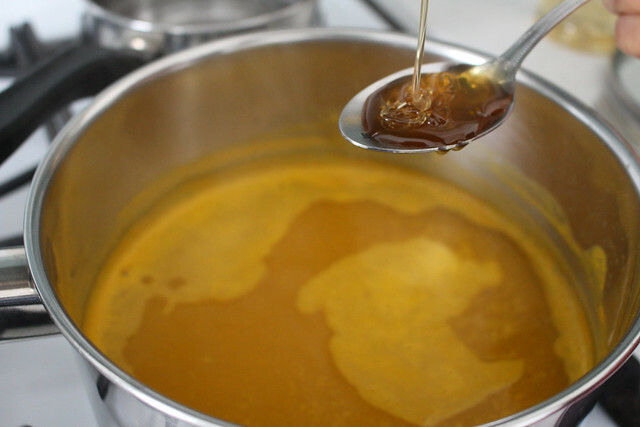 Then take your pot off the heat and add one tablespoon of honey or any other sweetener on hand. Be careful not to burn yourself and give your brine a taste test; you can add a little more salt or sweetener to suit your tastes. 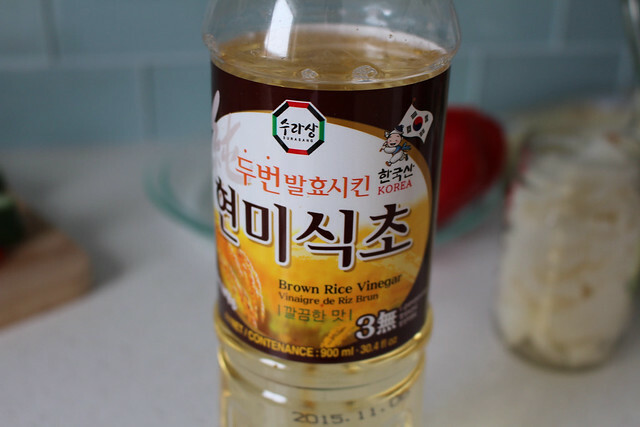 We use brown rice vinegar, but any vinegar will do. 4. Cover the radish slices with your turmeric brine. You want to do this while your brine is still relatively hot, as this improves the final crunch factor of your radish slices. If you wait until your brine has cooled down to add it to your radish, you'll end up with relatively soft radish with little crunch. Allow things to sit, uncovered, until your brine cools down to room temperature, then cover and allow the bottle sit out at room temperature for two days. After two days of fermenting, your radish slices are ready to eat. Store leftovers in the refrigerator and take out small portions as needed. While refrigerated, pickled radish slices are fine to keep around for at least a couple of months. I can't wait to make this and have the radishes to my shopping list. I always ask for extra radish when eating at my favorite Korean restaurant and now I can have it whenever I want! 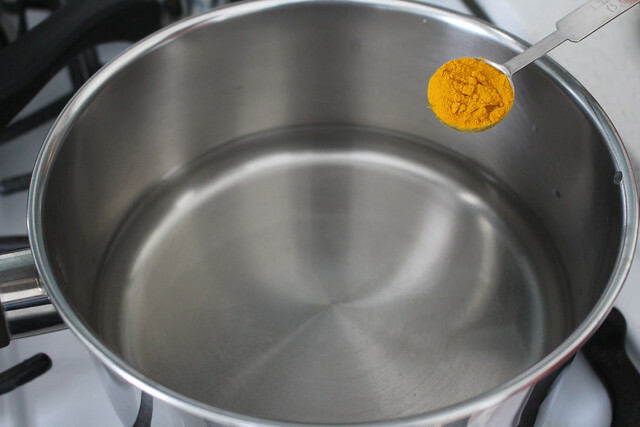 I didn't know they were dyed and I love that you're using tumeric to do that. I already have it in my kitchen! Yeah! This is so timely. 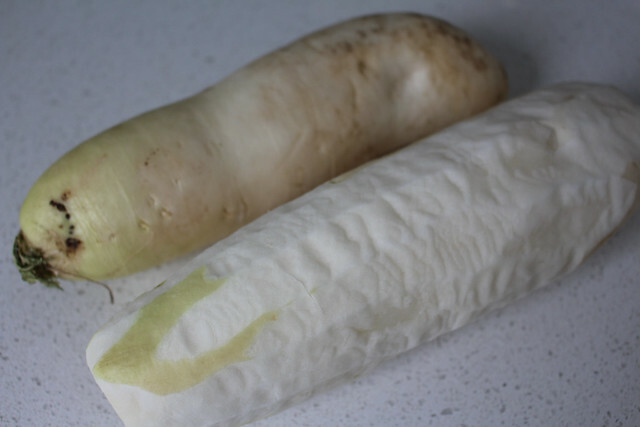 We have access to acres of Daikon radishes, so will definitely give this recipe a try! Thanks! Made the pickles yesterday and could not wait the two days to try them - OMG - wonderful - will keep these on hand. Can I replace the vinegar with something else, maybe some kind of fruits. Just like your cabbage kimchi with pear & apple. Thank you for your cabbage kimchi. It so good & natural. I'm sorry - I really don't know, as I haven't fiddled with this recipe. If you give something a try and it works well, I would love it if you could come back here and share. radish should be rinsed after standing in salt? or just squeezed from the salt water that was made? Thank you for your question, we are happy to help. Just squeezed from the salt water is good :).